Product code: VM911 Categories: Home Living, Kitchen Aids. Part of a range of dining aids, the Bendable Fork has a soft, cushion grip, so dining is easier for users with limited hand or arm movement. 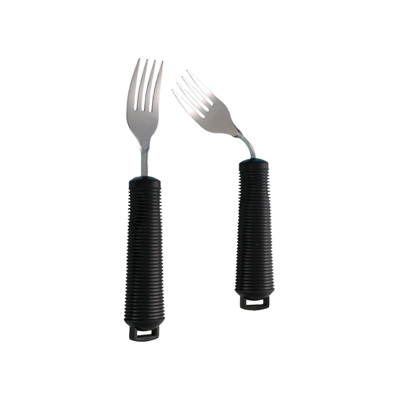 The neck of the Bendable Fork can be bent to any angle to suit the user, while the base features a loop, through which a securing utensil strap can be passed. Part of a range of dining aids, this Soft Grip Rocker Knife features a wide, soft cushion grip, along with a specially shaped blade to cut with a rocking motion. These features make eating much easier for those with limited hand or arm movement, while the base has a loop, through which a securing utensil strap can be passed.